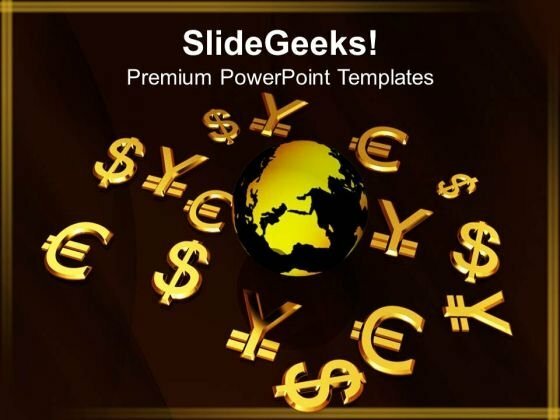 We present our World Currency Business PowerPoint Templates And PowerPoint Themes 1112.Use our Symbol PowerPoint Templates because, See satisfaction spread across the room as they unravel your gifted views. Use our Business PowerPoint Templates because,The ideas and plans are on your finger tips. Use our Finance PowerPoint Templates because,Your ideas are fundamentally stable with a broad base of workable possibilities. Use our Globe PowerPoint Templates because, Show how one can contribute to the overall feeling of well being. Use our Success PowerPoint Templates because, Clarity of thought has been the key to your growth.Use these PowerPoint slides for presentations relating to "Currencies around the world Business Symbol Finance Globe Success". The prominent colors used in the PowerPoint template are Yellow, Black, Orange Create desires anew with our World Currency Business PowerPoint Templates And PowerPoint Themes 1112. Evoke a need for greater achievement. Display your conscientious approach with our World Currency Business PowerPoint Templates And PowerPoint Themes 1112. Demonstrate your commitment to the cause.